Ready for your first game? First, choose which gaming platform suits you best and whether to go into battle alone, team up with a partner, or join a squad. Familiarize yourself with the controls, then get the key information you’ll need to jump right into battle. Pick the right drop zone to nail your landing strategy using a map of the game’s mysterious island with details on each named location, including where to find loot and advice on tricky-to-navigate areas. After an overview of game screen essentials to navigate and keep an eye on your friends and foes, you’ll find a detailed guide to looting. You’ll learn how to harvest materials for building, taking cover, and gain battle-winning vantage points and the strengths and weaknesses of each type. Find where and how to loot weapons, ammo, traps, and healing consumables for maintaining your survival. Become an all-knowing weapons expert with the advice on choosing and using weapons, including a guide to available pistols, sub-machine guns, light machine guns, assault rifles, shotguns, sniper rifles, grenades, and launchers. To master the game, you’ll need to learn how to build. 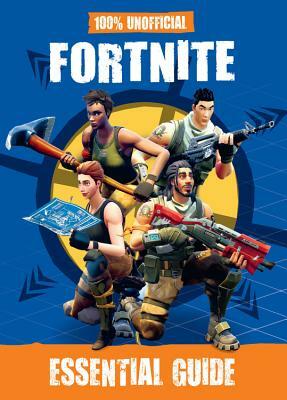 Here, you’ll learn how to build all types of walls, ramps, floors, and roofs, plus advanced tips for developing your building skills. An overview of movement fundamentals provides tips on how to lurk, creep, check your surroundings, and avoid being shot. Finally, put everything you’ve learned together with a review of combat strategies and scenarios. At the back, a list of vital dos and don’ts provides an overview of the key takeaways, and a safety tips page provides guidance for parents and younger fans.